A SpaceX Falcon 9 launches from Cape Canaveral, Florida, in January 2014. The latest cargo mission to the International Space Station won’t wind up docking there or delivering supplies. The unmanned Russian Progress 59 cargo ship is off course and spinning. Because its communications equipment appears not to have properly deployed, the crew on the ground has had a hard time diagnosing exactly what’s wrong with the ship. Missing the three tons of equipment that the Progress ship was intended to deliver won’t be a problem for the crew of the space station; it has a substantial reserve of food and equipment, precisely so that a failed mission won’t cause a crisis. Since the space station acquired its permanent crew in 2000, there have been 79 unmanned cargo supply missions, and only three have failed, including the Progress 59. But of those three failures, two have occurred in the past seven months; the other happened in August 2011. The three failed missions all failed differently. This week’s craft didn’t deploy the antennas required for clear communication with the ground. In October 2014, Orbital ATK’s Cygnus supply craft was scheduled to launch but never made it aloft. Within 10 seconds of the beginning of the attempt, part of the engine exploded. And in August 2011, a Progress cargo ship, launched by a Russian Soyuz rocket, managed liftoff but had a failure in the third stage of its engines. It didn’t make it into orbit and crashed in a remote, wooded area of Russia. The recent failed launches paint a portrait of the current options for cargo delivery to the space station. At present, the only ways to resupply it are Russian Progress ships, Japanese H-II Transfer Vehicles, and private companies’ crafts (Orbital ATK and SpaceX).1 Private ships are becoming a larger proportion of cargo flights. So far, two of the failed missions have been the result of older, Russian equipment. The original Progress design was used from 1978 to 1990. The most recent upgrade of the Progress design took place in 2008. Before the October 2014 failed mission, Cygnus supply crafts had had three previous successful missions to the space station. A fifth Cygnus attempt has been scheduled for November 2015. This will be the first year that the majority of space station cargo flights are launched by private companies. Four of the remaining seven cargo supply missions scheduled for 2015 are slotted for privately owned ships. The other flights will be made by two Russian Progress ships and one Japanese HVT. The recent, diverse failures may simply be statistical noise, not indicative of any new problem in the cargo supply process. 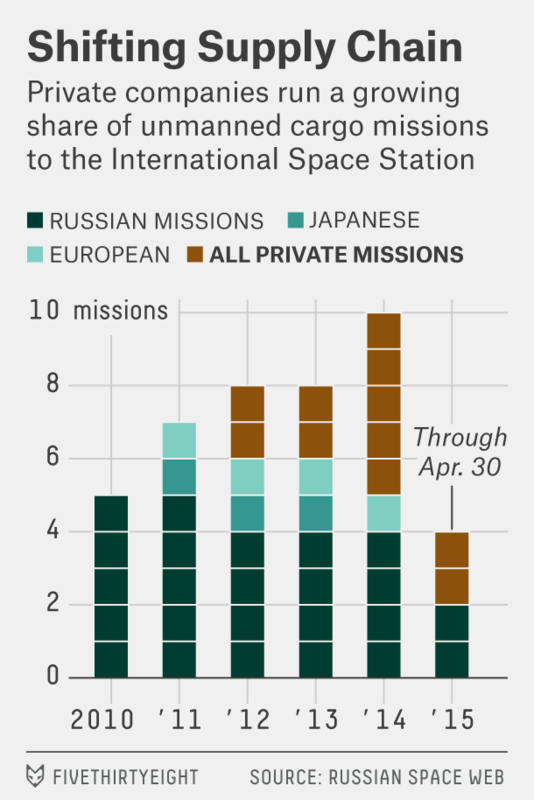 What is certain, though, is that the changing composition of supply flights means that the space station crew is more likely to need to call a private firm, not a nation’s space program, to figure out what’s gone wrong next time. The European Space Agency operated “automated transfer vehicles” until their final flight in 2014.